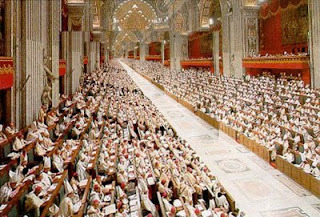 Lumen Gentium is the great Second Vatican Council document on the nature of the Church. It begins by describing the Church as a sacrament, that is, “a sign and instrument both of a very closely knit union with God and of the unity of the whole human race”. It then goes on to elaborate on the specific make-up of the Church―her hierarchy, her laity and her religious communities―as they serve and manifest this unity. In doing so, it emphasizes the “universal call to holiness” and also describes the Church’s supernatural destiny. The document closes with a meditation on the role of the Virgin Mary in salvation history and in the Church. How ought we to read this rich, complex document, teeming as it is with doctrines, images, ideas and exhortations? I think one fruitful way is to keep in mind the theme which is introduced at its very beginning: unity. If the Church exists to unite the human race to God, then we ought to interpret her composition, in all its complexity, as it reflects and brings about this union. Consequently, any consideration of part of the document in isolation, or any overemphasis of one of its doctrines over another, will detract from this central theme. Instead, we need to keep in mind that the diversity envisioned by the document ultimately serves a unity. It would be impossible to treat all of the document in a humble blog post, so let me look at one theme which I found striking: the relationship between the hierarchy and the laity in the Church. It is, I think, a timely topic, as there are a number of opinions floating around about what this relationship is or ought to be. While I do not intend to propose answers to practical questions, I think that it is instructive to return to Lumen Gentium and its vision of the Church as the sacrament of unity as a foundation for such issues. The society structured with hierarchical organs and the Mystical Body of Christ, are not to be considered as two realities, nor are the visible assembly and the spiritual community, nor the earthly Church and the Church enriched with heavenly things; rather they form one complex reality which coalesces from a divine and a human element. Consequently, neither is the hierarchy the primary constituent of the Church, nor, on the other hand, can we view it as some kind of accretion that can be neatly separated from a ‘deeper’ or more ‘spiritual’ Church. In reality, the Church contains the hierarchy as part of her complex, unified nature. The same goes, by analogy, for the laity. To think that one of either the laity or the hierarchy are more fully what the Church “is” is to miss the point. Rather, both are part of her unity and universality; and, “in virtue of this catholicity each individual part contributes through its special gifts to the good of the other parts and of the whole Church”. Understanding that both laity and hierarchy are part of the complex reality of the Church helps us to avoid a misuse of a term that is so central to Lumen Gentium: “the People of God” (It appears forty-one times.) Often I hear this phrase used in a way that implies that the People of God is the laity, as contrasted with the hierarchy. It should be clear by now that this is incorrect: both hierarchy and laity belong fully to the People of God. In fact, Lumen Gentium envisions the People of God as a unity not only of people at a particular instant, but also across time, beginning with the children of Israel: “At all times and in every race God has given welcome to whosoever fears Him and does what is right.” Finally, later on in Chapter VII, we are reminded that the People of God includes those members who have fallen asleep in Christ as well as all the citizens of heaven. Thus, there is an essential unity of the Church’s earthly hierarchy and laity within the People of God under Christ. One of the very reasons that the hierarchy exists is to make this unity evident and to protect it: “The Roman Pontiff, as the successor of Peter, is the perpetual and visible principle and foundation of unity of both the bishops and of the faithful. The individual bishops, however, are the visible principle and foundation of unity in their particular churches.” Given this unity, we might ask how hierarchy and laity ought to interact. Let us look at two aspects of their relationship which is extensively treated in the document: obedience and infallibility. In matters of faith and morals, the bishops speak in the name of Christ and the faithful are to accept their teaching and adhere to it with a religious assent. This religious submission of mind and will must be shown in a special way to the authentic magisterium of the Roman Pontiff, even when he is not speaking ex cathedra. Let [bishops] willingly employ [the laity’s] prudent advice. Let them confidently assign duties to them in the service of the Church, allowing them freedom and room for action. Further, let them encourage lay people so that they may undertake tasks on their own initiative. In other words, within the People of God, there must be a mutual listening and a cooperation between hierarchy and laity. Of course, it should go without saying from the above that their roles are complementary, not identical. The Council clearly teaches that bishops under the Roman Pontiff are the rulers of the Church on earth. Their ruling, however, needs to be pastorally attentive to those whom they serve, and they need to make way for lay people to serve in meaningful ways. We need only to turn to John 13:1–17 for a model of how our bishops ought to rule their flock. 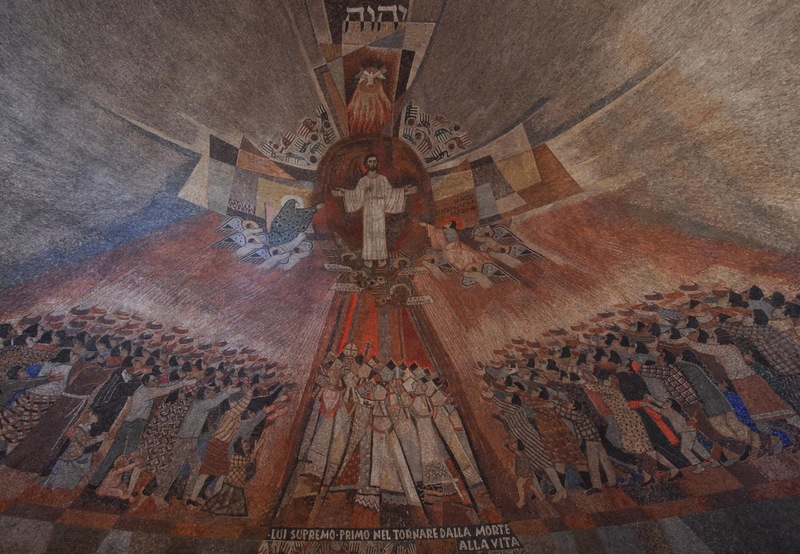 When it comes down to it, the logic of cooperation we see in Lumen Gentium only really makes sense if neither hierarchy nor laity exist solely for the sake of the other, but rather if both exist in a unity under Christ. For the Church on earth must discern Christ’s will, and its various organs, clergy and lay alike, attentively listen to all the People of God to hear his voice. This need to hear God’s voice puts in perspective the notion of infallibility. The Council reaffirmed the doctrine of papal infallibility, which is the mode of the transmission of dogma that we probably first think of when we hear the word “infallibility”. But it is useful to be attentive to how Lumen Gentium teaches this doctrine. When the Roman Pontiff defines dogma ex cathedra, he “is not pronouncing judgement as a private person, but as the supreme teacher of the universal Church, in whom the charism of infallibility of the Church itself is individually present.” That is, the charism―or divine gift―of infallibility belongs to the Church, not to “a private person”. Thus, while Lumen Gentium makes it clear that papal infallibility is not contingent on being ratified by anyone else, at the same time it teaches that sure doctrine can be received through other organs among the People of God. First of all, it teaches that when all the bishops under the Roman Pontiff teach in unison a doctrine of faith or morals that is to be held definitively, they do so infallibly. This most commonly occurs during ecumenical councils―such as the Second Vatican Council. The entire body of the faithful, anointed as they are by the Holy One, cannot err in matters of belief. They manifest this special property by means of the whole peoples' supernatural discernment in matters of faith when “from the Bishops down to the last of the lay faithful” they show universal agreement in matters of faith and morals. This last quotation summarises things nicely: the charism of infallibility belongs to the whole Church. The laity exercise it as a body in union with their bishops, especially the Bishop of Rome. The bishops exercise it in union with each other under the Roman Pontiff. The Roman Pontiff himself exercises it insofar as he is the head of the unified Church under Christ. This vision should help us to understand, then, what the sensus fidelium really is. When I hear this term used today, it often seems to be applied to the laity in contrast―or even opposition―to the hierarchy. (One even gets the impression that sensus fidelium refers to the majority opinions of white, middle-class Catholics living in the West.) But just as the People of God includes the whole Church, so does the sensus fidei belong to all. In fact, it is only authentic when it is exercised in unity. Consider this also an invitation to read Lumen Gentium and other documents of the Council for yourself―and comment about it on this blog if you find something worth sharing! Returning to the Council documents during this Year of Faith would be an excellent way to be a fruitful member of the People of God. Consider making them your spiritual reading. Only if we are familiar with the teachings of the Council can we take responsibility for continuing and deepening their implementation in our Church.